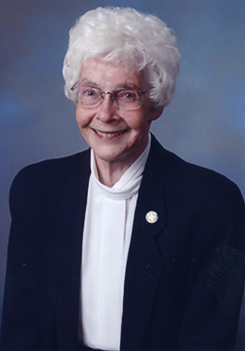 Sister Joanne Graham, 76, a member of the Benedictine Sisters of Annunciation Monastery, Bismarck, entered eternal life Monday, April 11, 2011, at a Bismarck care facility. Mass of Christian burial will be held at 10:30 a.m. Saturday, April 16 in the Our Lady of the Annunciation Chapel in the Benedictine Center for Servant Leadership. A wake service is scheduled for 7:30 p.m. Friday, April 15 in the Chapel of Annunciation Monastery. Sister Joanne served in leadership positions for 50 years as a monastic woman. She was a nurse, nurse educator, hospital administrator, prioress of Annunciation Monastery, chancellor of the Bismarck Diocese and vice chancellor of the Diocese of St. Cloud, Minn.
She was born March 8, 1935, in Hot Springs, S.D. to Edmund A. and Eunice F. (Kinghorn) Graham and given the name, Rita. She grew up with a younger brother, Charles. While earning a bachelor’s degree in nursing from St. Louis University, St. Louis, Mo., she felt a tugging at her heart to try religious life and was drawn to the Benedictine charism. Shortly after graduation in 1958, she boarded a plane to a place she had never seen before - Annunciation Monastery and the prairies of North Dakota. Here she began life as a Benedictine sister and received the name Joanne. She made monastic profession July 11, 1960. After teaching in the St. Alexius School of Nursing and working in obstetric nursing, she was asked to earn a master’s degree in hospital administration from St. Louis University and was appointed administrator of St. Alexius Medical Center in 1966, a position she held for 10 years. Then she was elected prioress of Annunciation Monastery in 1976. After completing her term as prioress, she served as associate administrator at St. Alexius. In 1986 she was appointed vice chancellor of the Bismarck Diocese by Bishop John F. Kinney and later became chancellor of the Diocese, serving in that post until 2003. Sister Joanne earned a pontifical degree in canon law in 1988 from The Catholic University of America, Washington, D.C. At the time she became chancellor, she was one of only six women in the United States to fill that position in the Catholic Church. She also served from 2005 to 2006 as vice chancellor of the Diocese of St. Cloud. Sister Joanne worked with canonical matters for the Federation of St. Benedict and Annunciation Monastery, was a certified spiritual director and chaired the Annunciation Monastery Sponsorship Group. She served as a member of the University of Mary Board of Trustees for 30 years and was awarded an honorary doctorate in leadership by the university in 2009. Sister Joanne is survived by her brother and sister-in-law, Charles and Rita Graham, her aunt Elaine M. Hill, all of Denver, Colo., cousins, many friends and the Sisters of Annunciation Monastery. To share memories of Sister Joanne, visit wwwparkwayfuneral.com and sign the online guest book (Parkway Funeral Service, Bismarck). On behalf of the Sisters of Annunciation Monastery and Sister Joanne’s family, I again want to thank you for being here today. It is comforting and meaningful to us to have you share in this celebration and remembrance of Sister Joanne’s life. She was a special gift to all of us and we will greatly miss her presence among us. It is fitting that our celebration of Sister Joanne’s life is in this chapel in the Benedictine Center for Servant Leadership - for that was who she was - a servant leader who gave all she had to whatever she was asked to do. The Gospel she chose for her funeral is about giving one’s life in the service of others as Jesus did. If a grain of wheat falls to the ground and dies, it bears much fruit, says Jesus. “Whoever serves me must follow me,” Sister Joanne bore much fruit by laying down her life and following Jesus in the service of others. She used her exceptional leadership skills for the good of many people including our monastic community, the Federation of St. Benedict, St. Alexius Medical Center, the University of Mary, the dioceses of Bismarck and St. Cloud as well as the civic community. It is true – Sister Joanne was one of those visionary leaders who could see the bigger picture. She knew the reality of the day yet could name what would be needed in a future that many of us could not even imagine. It was a rare gift she shared with us for which we are most grateful. Sister Joanne helped guide our monastic community, the diocese and our sponsored ministries into the future. A woman of deep faith, strength and perseverance, Sister Joanne was one of the pillars of our monastery. She loved the Benedictine life and gave herself entirely to it. We could count on her to participate in our common life, in community prayer, in meetings and special events, in helping with the cooking and dishwashing when she was able, and just being there for us. She was a monastic woman through and through. Even when her health began to wane and her breathing became labored, she pushed herself to participate in our life as much as possible. She also gave of herself to help further our Benedictine charism in our sponsored institutions by promoting and guiding a new model for our Ministry of Sponsorship. We want our Benedictine mission and values to continue at St. Alexius, Garrison Memorial Hospital and the University of Mary. Sister Joanne was one who saw that a new vision of sponsorship needed to include our colleagues to more effectively understand and spread the Benedictine charism. This was important to her and it is important to us. We are grateful for her leadership in helping establish this new model of sponsorship. Now it is our task to keep it going. Sister Joanne, we do rejoice with you. You have gained your heart’s desire: to live in the house of the Lord all the days of your life. We thank God for your presence, love and powerful witness of servant leadership. You will live on in our hearts and memories forever. My dearest Sisters of Annunciation Monastery, especially you Sister Lawrence, Joanne's classmate of over 50 years; Charlie her brother, Benedictines from Sacred Heart Monastery, St Benedicts Monastery, St Scholastica Monastery, St martin's Monastery, School Sisters of Notre Dame, colleagues from St Alexius, Garrison Memorial Hospital, the University of Mary, the Diocese of Bismarck, the Diocese of St Cloud. Friends. Thank you for being here tonight to celebrate the life of someone we admired and loved - Sister Joanne Graham. Sister Joanne asked that we share memories of her in the cafeteria after the service. She wanted the focus now to be on the Scripture, the Psalmody, on our redeeming Lord, and on the culmination of her monastic journey - life in Christ. Can't you just hearing her saying to us, "People, I hope you listened to the Scripture I selected. These are words I want you to hear." And so, please listen again to some of the verses which spoke to me. There's this - I am go to prepare a place for you, so that where I am you may be also. · Sister Renee driving her to St Alexius an hour before Mass so she could take the necessary time to walk down the hall, regain her strength, and be ready to participate. · I've had the gift to be able to scope out parking lots, reserve a table close to the door and establish readiness with a waiter so that we could go out to lunch at the Olive Garden or Woodhouse or Dairy Queen. Why did we prepare a place? So that where we were, she also may be. And now, we who have known Sister Joanne throughout her lifetime have prepared her for the ultimate welcome by the One she loves above all else. The One who loves her. God who created her in all her uniqueness, who stood by her in the beauty and the pain of her journey with us, now asks us to let go that she may enter fully into the place that Jesus, her Lord and Savior, has prepared for her. My Dad and Sister Joanne have been friends and colleagues for 45 years. When I called Dad to tell him of Sister Joanne's death, he said a simple phrase that I have heard echoed in various ways by others - "I wish I could have had one more conversation with her." How many of us, likewise, wish we could have one more conversation with her - because we know it would not be trivial. How many of us wish we could have one more meeting in which to rely on her directness, even if it is towards us - because we know that she not only expected much of others, she expected it of herself. How many of us wish for one more time to come to prayer: see her, hear her, and be reminded of the cost of faithfulness. And what would Sister Joanne Graham say? She would simply say "Well, Do it. Now." Live with intensity. Push the boundaries. Have the conversations that matter. Stay true to your commitments. Believe the words in this scripture I have chosen for tonight: " Do not let your hearts be troubled; believe in God; believe also in me. I am the way and the truth and the life." What would Sister Joanne Graham say? Jesus is the way - but you must choose to walk it. Jesus is the truth - you must choose to speak it. Jesus is the life - each of you must choose how you want to live it. Thank you, Sister Joanne, for living life with such conviction and faithfulness. We are better people for having lived with you.